My LOVE for PINK will always be true! I’m sure most of you have noticed that I’ve gone back to my platinum color. I have LOVED having my pink hair, and never intended it to be pink for this long…..nine months! If you remember it was back last February, when I went PINK for a campaign I was doing for Brookside Chocolate. It was my “BALLSY” resolution for 2018. I thought perhaps I would keep it around for a few months and then go back to platinum. I also thought it would be very challenging to dress in certain colors, and possibly need to have to change my makeup. Well……none of that was true! My PINK hair has sort of become my signature. I can’t tell you how many emails and messages I’ve gotten from all of you out there, showing me your PINK hair! Or, telling me that they admired me for being brave and different and unique and confident! 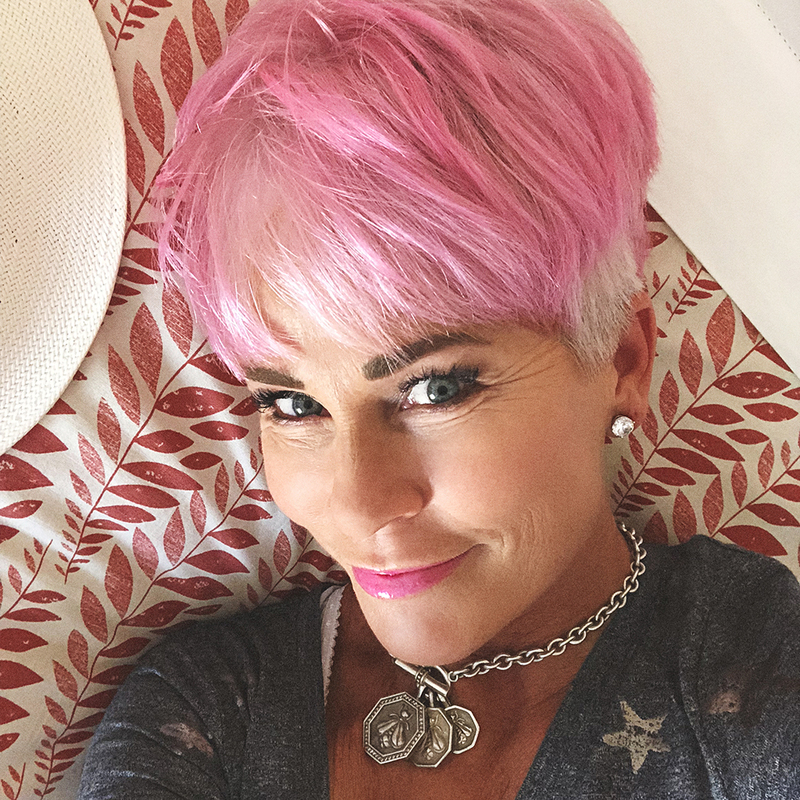 I remember when I first saw my mom after I went pink, and she instantly let me know….in a nice way, that she didn’t care for it. That was probably the hardest part about having pink hair. After all, no matter how old you get, your mama’s opinion is always important! But I really was feeling a change was in the works! I wanted to keep it through Mexico just because it just seemed like the two went together! But I have loved the change!!! It’s so easy to get bored with ourselves, so doing something new….even the smallest thing, can lift our spirits and make things feel fresh again! I loved my PINK and may even go back to it again some day, but for now this feels right! Since I love PINK so much, I’ve linked my favorite PINK things to shop for! Yep it’s time to start thinking about SHOPPING! It’s never too early to get a jumpstart on your holiday shopping! Some gifts for him, some gifts for your littles, some gifts for friends, and of course some gifts for YOU! MY FAVORITE THINGS IN PINK! P.S. And thank you to AVEDA for keeping my hair fresh and good! And guess what….they have their OWN PINK COLOR NOW!!! You should go in and give it a try….I never got a chance to, because of the change. Yes, it’s THAT NEW! My Landis Aveda salon is here and Harley is my stylist! I love your beautiful silver hair – the pink was fun, but you look fabulous in platinum! I’m looking forward to seeing your change. My hair has been natural salt and pepper for almost two years and I’m really craving something different, too. You are such an inspiration! I wish I was bold enough to cut my hair….your style is awesome. I noticed you are no longer wearing your wedding ring. I may be jumping to conclusions… Just thinking about you. Take care and keep up the great posts!!! Sorry, but I never cared for the pink hair. You’re a standout with the platinum! Hi Connie, yes PINK isn’t for everyone. LOVE my platinum too! Have a great week! Agreed. Shauna, you’ve been “whispering” to us for some time now. Your Tribe is here ready for you when you need us. Over and out lol.